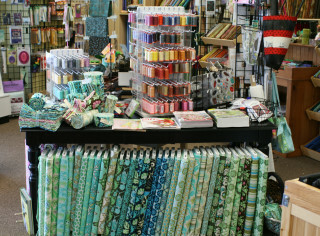 Webfabrics is an all-round quiltshop where every quilter can find the best of the best in any style of fabric. We carry top collections in basics, batiks, contemporary fabrics, traditional fabrics, reproduction fabrics and many novelties. Over the years we have become well known for our complete collections in basics and blenders. Webfabrics started in August 2003 and has since then grown into a top online quiltshop. All our basics have a sticker with the individual color code. This will make it really easy for you to remember the colors. Labels are available on all Moda Marbles, Hoffman Bali Batik 1895, Benartex Fossil Fern, Andover Dimples, and Michael Miller Fairy Frost. All these collections have at least 100 colors and we carry them all! You can buy individual fat quarters online. That's right: just 1 fat quarter! We have beautiful bundles! Bundles have at least six pieces in either fat quarters or 0.5 yards. We keep the prices for the fabrics reasonable and are always negotiating with our suppliers for deals to pass on to you. We ship your order within a few hours. If we are not able to send the order right away, we will email you to notify you. We don't work with back orders. If an item isn't in stock, we will let you know. Of course, we will inform you when it is back in again, but we do understand that you may have found it somewhere else and just want to sew! We offer quick, personal and friendly customer service. You can always call/email us with all your questions and suggestions. 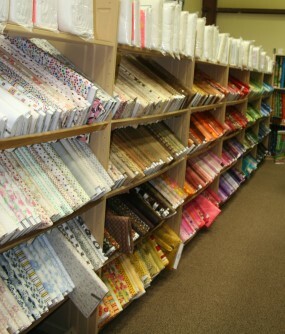 If you are in Northern Virginia, you can touch all the fabrics we have online! 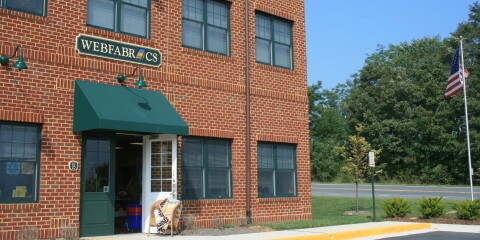 The shop is located in Purcellville VA, about one hour west of Washington, DC. 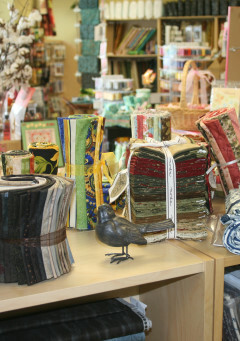 Our store is spacious, well-lit and has all the fabrics you see online, plus many more books and notions. New fabrics are arriving daily!